Greater Toronto Area REALTORS® reported 3,158 transactions through the TorontoMLS system during the first 14 days of September 2013. This result was up by 29 per cent in comparison to September 2012. Sales were up for all major home types on a year-over-year basis. The condominium apartment segment led the way with strong sales growth in the City of Toronto. “The strong growth in sales that we have seen over the past two-and-a-half months indicates that GTA households are approaching home ownership with a renewed sense of confidence. Prospective home buyers have taken a hard look at their household balance sheets over the past year and have found that, despite stricter lending guidelines, there are affordable property types from which to choose,” said Toronto Real Estate Board President Dianne Usher. 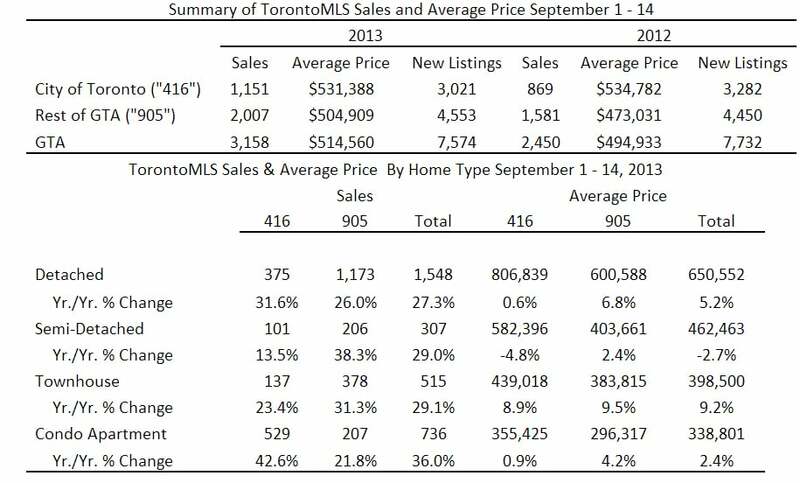 The number of new listings entered into the TorontoMLS system was down slightly in comparison to the same period in 2012. Strong sales growth coupled with a slight reduction in new listings points to increased competition between buyers in some market segments and the continuation of above-inflation rates of price growth. The average selling price at mid-month September was up by four per cent on an annual basis to $514,560. “With months of inventory remaining low from a historic perspective and evidence of tighter market conditions during the summer, the only argument that makes sense is for continued home price growth in the Greater Toronto Area for the remainder of 2013,” said Jason Mercer, TREB’s Senior Manager of Market Analysis.